Father Walter needs to walk long, very long ways… sometimes he walks one, two… up to six hours to visit the remotest community in his parish. 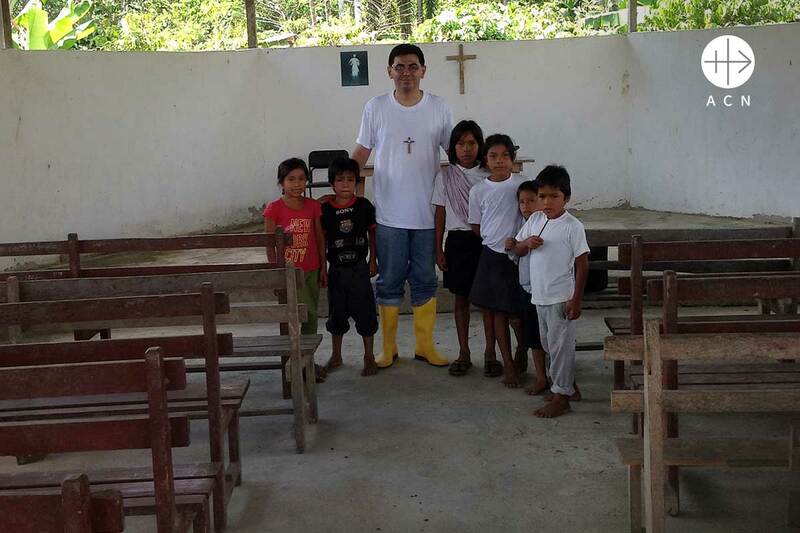 He is a missionary in the Apostolic Vicariate of Napo. Do you know where Napo is? Napo lies in the heart of the Ecuadorian Amazon region. This region in Ecuador is mainly populated by indigenous communities who live scattered in a vast and hardly accessible terrain. It is not easy to go there, no plane, no train, no car… It is practically impossible to build proper roads in the dense rainforest. Besides, the River Napo – one of the Amazon’s largest tributaries – crosses right through the vicariate. Sometimes the river rises so rapidly that it is impossible to cross it. 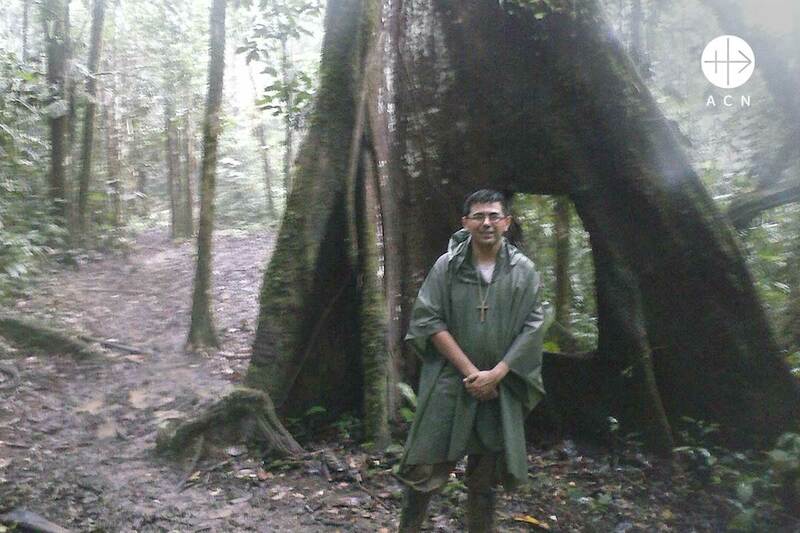 For Father Walter Coronel and his fellow priests this means facing harsh difficulties such as the long distances between communities, the difficult terrain and the hard weather – it rains every day of the year – in order to serve the Catholic faithful. But he loves to visit and spend time with the communities there. They live in very simple and humble conditions; many are affected by dire poverty. The rural indigenous people tend to marry at a young age and have large families of at least 5 children. Many of the native children and elderly people cannot speak any Spanish, but only their own Quechua language. Father Walter cannot speak this language but thanks to the indigenous catechists and community leaders, the missionaries can communicate with the indigenous groups. Aid to the Church in Need has helped them with the publication of a prayer book in Quechua to be used in the catechesis classes. We think that it is important that people can speak and pray to God, our Father, in their mother tongue. 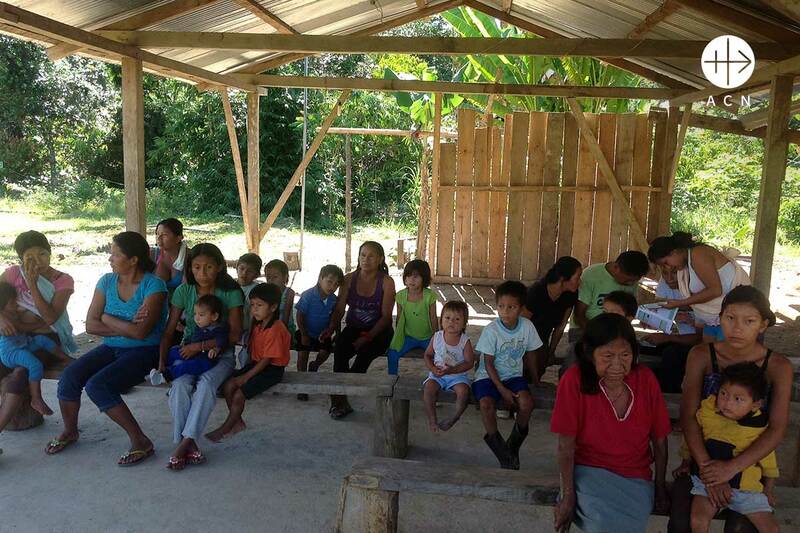 The people of Napo would like to have small chapels (“capillitas”) to pray together. ACN is helping them to complete this dream, and they have started building some of these capillitas in the most populated villages of the area, which are reference points for the scattered communities. Sometimes these places are also of vital importance in the case of emergencies. 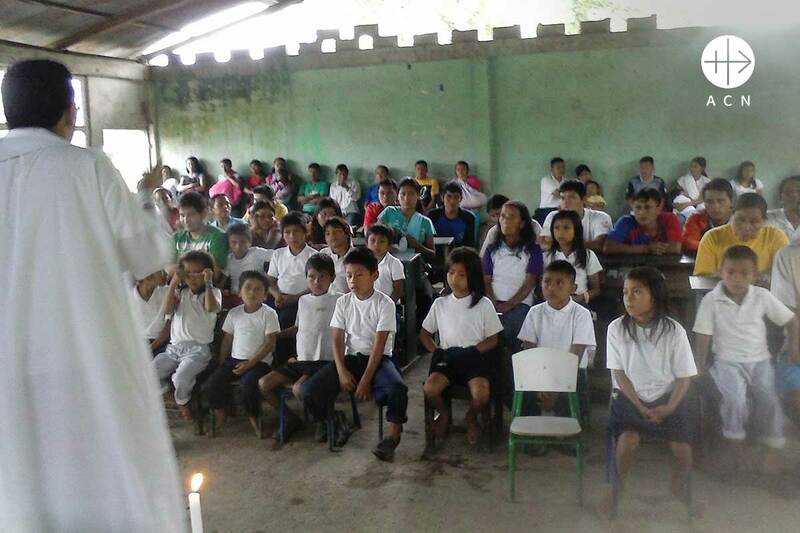 Few months ago a heavy rainfall caused the river Napo to overflow, and Father Walter sheltered some families in the hall for catechism next to a small chapel. 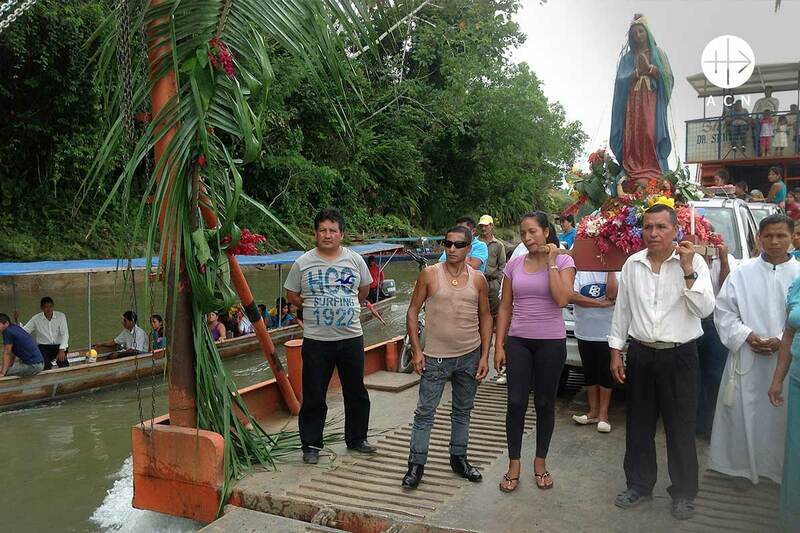 On occasion of the Year of Mercy they wanted to build up a Way of the Cross of Reconciliation to a grotto chapel located in a beautiful top spot, next to a waterfall, that is frequently visited by catechetical groups. The indigenous people are very fond of confession, the sacrament of reconciliation, thanks to the evangelisation carried out in the last 50 years by Italian missionaries of the Congregation of Saint Joseph (also known as the “Josefinos of Murialdo”). As an example: they have a beautiful practice, every Eucharist is preceded by the celebration of the Sacrament of Reconciliation. They happily welcome every invitation to reconciliation and mercy, as they are very keen in pleasing God. We could ask the Lord to give all of us the same disposition that our brothers and sisters have in Napo, in the middle of the Amazon and so far for us – by taking reconciliation as a way to please God, we can get closer to them. 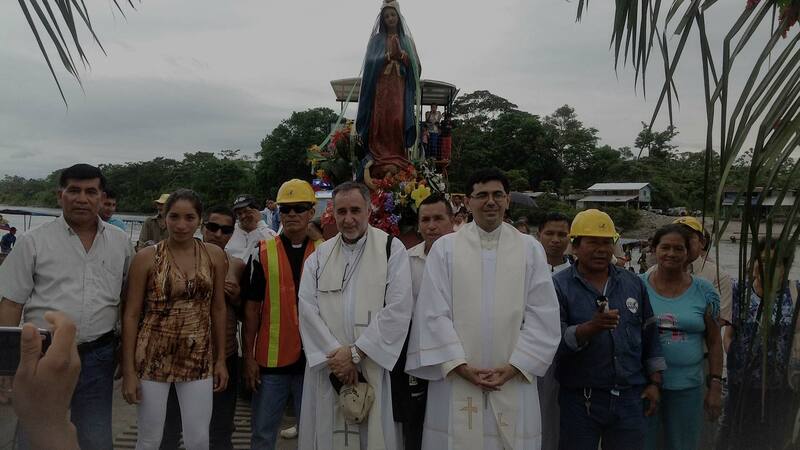 With the generous help of our benefactors, we made their dream come true of building a Way of Reconciliation to celebrate the Jubilee of Mercy in the heart of the Amazon rainforest.